My dear friend, Laura, shared a recipe with me years ago called ” Sweet and sour Chicken”. It calls for 1 lb of boneless, skinless chicken breasts, 1 small bottle of Catalina dressing, 1 jar of peach preserves, and 1 envelope of onion soup mix. Simply mix together, pour over chicken breasts and bake. I have experimented with this basic recipe many different ways. Using pineapple preserves and the juice and zest of 1 lime creates the refreshing flavors of the Caribbean. An Asian-inspired variation uses orange marmalade and soy sauce topped with crispy chow mein noodles or wontons. This year I am trying to eat healthy meals that are easy to make. I do not want to spend my time in the kitchen but I want to create meals that matter. I want healthy, tasty meals, that do not require a lot of dishes. I came up with this recipe. You can cook this in the crockpot on low for 6 hours. I cook it in the oven at 375 degrees for 50 minutes. Do not forget to use a meat thermometer to make sure it is cooked correctly. You can use cranberry sauce if you do not have fresh cranberries. 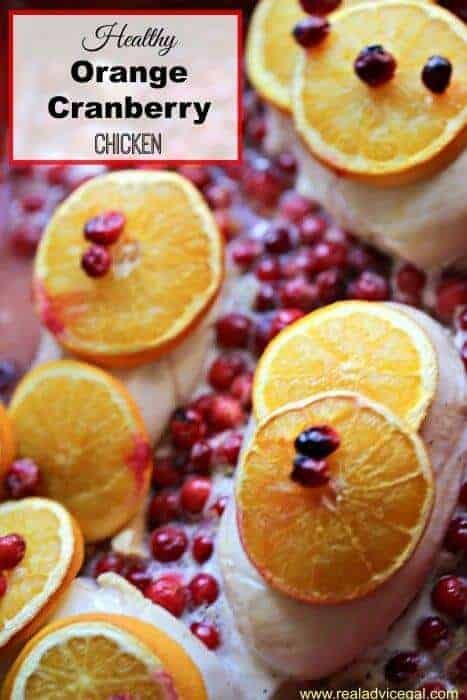 Enjoy our Cranberry Orange Juice Chicken!